(NaturalNews) One of the most potentially severe side effects of diabetes is kidney failure, which occurs as abnormally high levels of glucose in the blood slowly damage and destroy the blood-filtering organs. But according to a new study conducted by researchers from Anglia Ruskin University, and published in the journal Experimental Physiology, a diet high in junk food might do just as much damage, even in the absence of diabetes. "The Western diet contains more and more [of] processed junk food and fat, and there is a well-established link between excessive consumption of this type of food and recent increases in the prevalence of obesity and type 2 diabetes," lead author Dr. Havovi Chichger said. "In our study, type 1 and type 2 diabetes both induce changes in glucose transport in the kidney. But, junk food or a diet high in fat causes changes that are very similar to those found in type 2 diabetes." The researchers fed one group of rats a diet consisting of junk food, including cookies, cheese, chocolate and marshmallows, for eight weeks. They fed another group a high-fat rat chow diet for five weeks (60 percent of calories from fat). They observed the changes in glucose transporters in the kidney, starting when the rats began to eat the less healthy diets. "Understanding how diet can affect sugar handling in the kidneys and whether the inhibitors can reverse these changes could help to protect the kidneys from further damage," Chichger said. The researchers found that rats eating both the junk-food and high-fat diets experienced increases in the glucose transporters GLUT and SGLT and their regulatory proteins, similar to the changes seen in earlier studies of rats with type 2 diabetes. This suggests that both high-fat and junk-food-heavy diets cause increases in the amount of glucose circulating through the kidneys, comparable to those caused by type 2 diabetes. The findings are surprising, since diabetes is largely defined by high fasting levels of blood glucose. In type 1 diabetes, glucose levels remain high because the body does not produce enough of the sugar-lowering hormone insulin. Type 2 diabetes is typically the result of poor diet and a lack of exercise, and occurs when the body becomes desensitized to insulin, allowing blood glucose levels to rise. But the findings may suggest that a very unhealthy diet could produce diabetic symptoms – with the attendant risk of side effects – even in the short term, without full-blown development of the disease. Kick your junk food addiction! Of course, the damaging health effects of a diet high in fatty junk foods are well known. A major consequence of such a diet is a disorder known as metabolic syndrome, which has been linked to chronic health conditions including not just diabetes, but also cardiovascular disease, stroke, cancer and dementia. 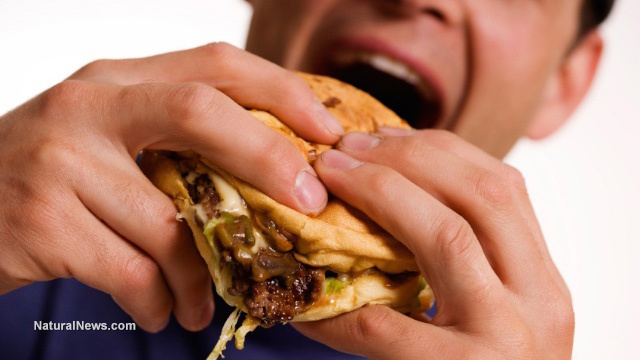 Numerous studies have also indicated that junk food may be nearly as addictive as heroin. In particular, a series of studies conducted by researchers from the Scripps Research Institute, and published in the journal Nature Neuroscience in 2010, showed that rats given unlimited access to junk food developed all the signs of addiction, including desensitization, compulsive eating, and a willingness to continue eating even when punished with electric shocks. Astonishingly, addicted rats actually starved themselves for two weeks when their access to junk food was removed, rather than going back to eating the rat chow they had been fed when they were younger. This does not mean that there is no hope for making healthy changes. The researchers noted that rats in the studies became addicted to junk food at much higher rates than human beings do when presented with unlimited access. And the very act of recognizing the addictive power that junk food has may be the first step that many people need to be able to start making changes.